Heavy duty grain/hay feeder keeps your feed off the ground. 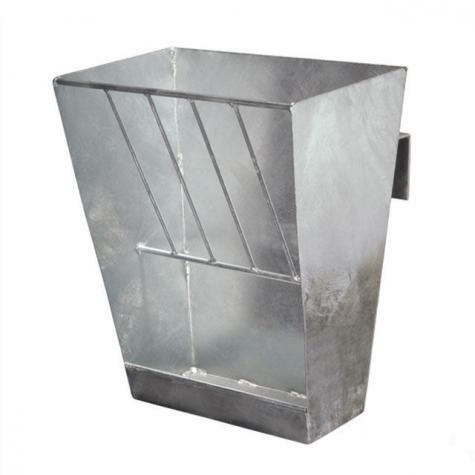 Inverted 4" L-Hooks enable feeder to hang on panels and boards up to 2"
Sturdy, hot-dip galvanized wire panels are great for lambing and kidding pens, gates, fence lines and many other projects. 1/4 in. dia. rods. 4"x4" spacings. Provides a strong, reliable connection that is also a 360º hinge. Surprisingly easy and fast to use. Reinforced galvanized welded wire panels. 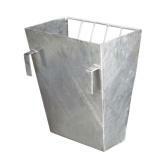 Great for building lambing jugs, gates, fence lines and many other projects. 5 lb capacity scoop with forward facing handle. 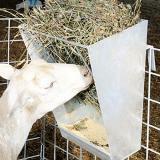 Useful for scooping feed out of bags or narrow containers. Recommended: 3 out of 4 said they would recommend this product to a friend. This is a very nice feeder. 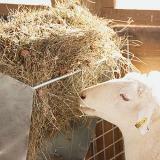 Both hay and feed work equally well in it. It would have been nice to have drain holes factory drilled into it, but a few minutes with my drill and my problem solved. Some my not want the holes in theirs, so I guess that is a personal preference. Feeding single rams with this feeder. Needs to have a bigger pan for feeding grain. Bars could be wider and set out farther to the front. Big rams can pull feed from the top. It only holds 1 small block of hay. Built well and appears to be holding up to abuse that rams dish out. This was the main reason for purchase. feeder is better than I had, which was nothing but goats still waste lots of hay with this feeder. They drag hay out top, should have some sort of flap for a covering. Is a bit smaller than the flakes, too. this is a great single animal feeder. I set this up for my goats and it holds enough hay where I don't have to feed every day plus I feed beet pulp pellets in the bottom. Took me all of less then a minute to set up. Ease of use and filling my needs for the animals makes this a no brainer. The price is the best on the market.